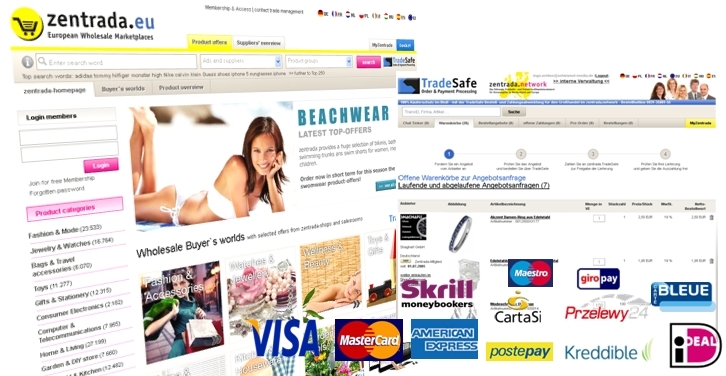 Welcome in the Leading Online Buyer Network for the European Wholesale for Toys and Consumer Goods. Become a member for free in the zentrada.network, benefit from the exclusive Top suppliers for toys, games and more from all over Europe, and use the information advantage of a wholesale network in the Internet. The business with toys, playthings and games lives on new ideas, trends and infinite variety to motivate kids and their parents to a purchase and create revenue in the business. The professional sourcing through a European Internet network with all product groups as zentrada provides you variety, speed, flexibility and cost advantages, which you need in the toy business. The classic trading structures in the distribution and wholesale purchase of toys broke up long ago. Regional trading, specialized trading, online trading, incentive trading and the free time market offer toys, sport articles, games and playthings to a growing and dynamic target group year-round. More than 350.000 retailers have with the wholesale network from zentrada an online access to more than 1.000.000 trend products, assortment products and remnants, which includes a big percentage of products from the area of toys. Visit our Product Group Toys & Games or our Buyers World Toys and Gift Articles without any commitments for a first overview of the wide supply for your wholesale purchase. Order Toys easily and safely Europe-wide online with our free TradeSafe service and the 100% Buyer Protection. We protect our members with the unique order and payment processing system not only from fraud, but also from wrong deliveries, wrong amounts, defects and delivery damages, terms and conditions traps and legal protection problems or the delay in delivery in wholesale orders. You pay before the delivery through your bank or with one of the other 15 European paying ways to TradeSafe and you have then the possibility to stop the out-paying to the supplier if any problems occur. Then TradeSafe looks European wide after a fast solution. Discover the zentrada Toy Wholesale in the Logout Mode. Proceed to the Free Registration to the zentrada. Here you are able to find Product Ideas and Top offers for the Wholesale Purchase of Toys, Games and Gifts at the Top Suppliers from all over Europe. Benefit from the Advantages of the Internet and Europe to improve your Buying of Toys. Researching, comparing and ordering are online through the zentrada network easy and safe possible, even in the wholesale. You don’t have to pay the sales tax to foreign suppliers with a domicile in the EU, if you have a European sales tax identification number. Furthermore, the wholesale supply is in the Toy segment as well huge and varies from baby toys, bricks & constructions, experiments & discovering, parlor games, wood toys, children cars, tryout games, model cars, music instruments, outdoor toys, dolls & stuffed animals, puzzles, RC-toys to disguises & costumes. and you will find our bestsellers and thousands of current offers and wholesale shops of Heinemann Wholesale, Legler Toys Wholesale oder Pappnase. Furthermore, visit our Buyers World Toys & Gift Articles with thousands of offers, bestseller lists and wholesaler rankings to many product groups of the Toy Business. .... are the top search words on zentrada and the categories in the Buyers World for you as a reseller of toys. Besides that, we offer a lot of product ideas, news and articles in every price category for the trade.